Telerik RadRibbonView provides a simple and consistent way for building interfaces similar to the ribbon control used in Microsoft Office. The new Ribbon Backstage control allows you to achieve a more native Office 2010 look and feel of your application. The RibbonBackstage appears when a user clicks the Application Button. 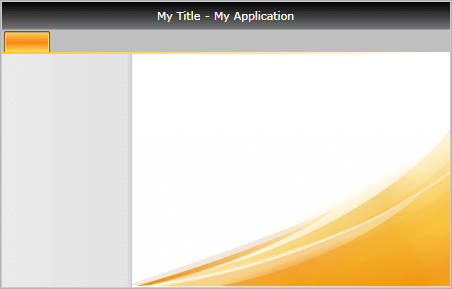 It can be used to display controls, used to perform actions on the entire document, like Save, Print and Send. 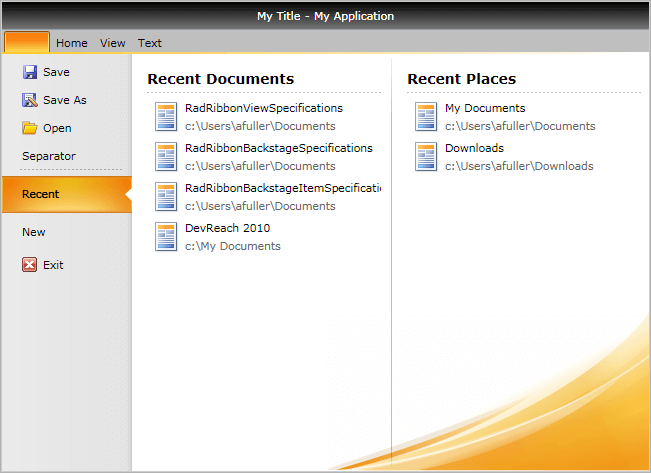 The RibbonBackstage can also provide a list of recent documents, access to application options for changing user settings and preferences, and application exit. By default the Backstage isn't opened. In order to control its state you can set the RadRibbonView's IsBackstageOpen property. In order to add a backstage to your RadRibbonView control you need to set the RadRibbonView's Backstage property. The next several code-snippets show you how to do that in XAML, as well as in the code-behind. The Backstage control derives from the RadTabControl. That fact allows you to easily customize it by adding/removing BackstageItems (the BackstageItem derives from a RadTabItem). WindowMinHeight: Specifies the minimum Height of the window when the backstage is open. WindowMinWidth: Specifies the minimum Width of the window when the backstage is open. IsSelectable: Specifies whether an item can be selected. If you set this property to False, the item will behave like a Button. If the BackstageItem IsSelectable property is set to False, you will be able to take advantage of the Click() event of the item, as well as its Command property. IsDefault: Specifies whether the item should be selected when the Backstage is opened. Please note that if you set the IsDefault property of multiple BackstageItems to True, the last one marked as default will be selected. IsGroupSeparator: Specifies whether an item is a group separator. Such items are used as a heading in order to differentiate a logical group of BackstageItems. CloseOnClick: Specifies whether the Backstage will be closed when the item is clicked. If the BackstageItem is not selectable the CloseOnClick property is set to True by default. However, if the item is selectable, then the CloseOnClick property won't affect its behavior. <TextBlock Margin="0 0 0 2"